Pavermodule, Inc is headquartered in Pompano Beach, Florida with manufacturing facilities throughout Florida. Pavermodule is the premier manufacturer of paver brick in Florida. The management team along with an ESOP were the shareholders of the company. 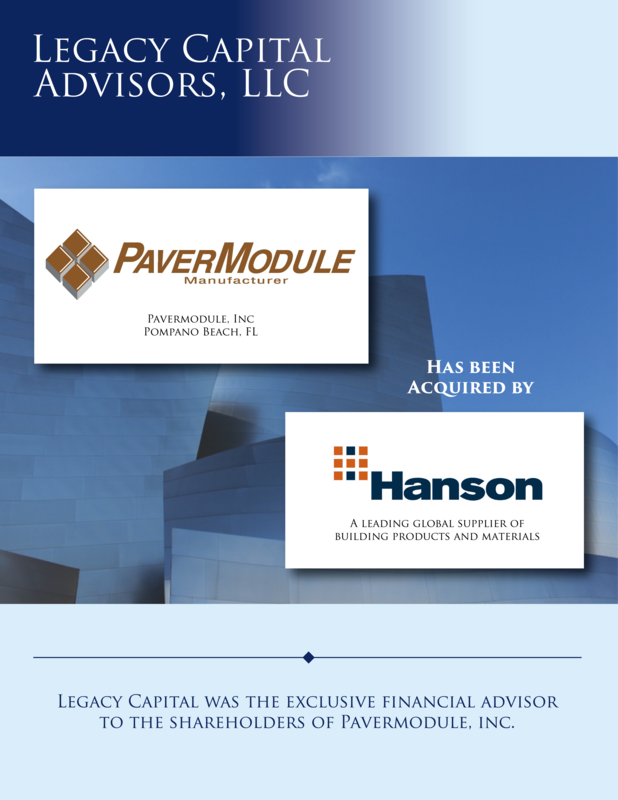 After receiving an unsolicited offer from Hanson, on the advice of counsel, they engaged Legacy Capital Advisors to assist with negotiations and closing the transaction. Hanson, PLC headquartered in London, England is a leading supplier of building materials and products. One of the shareholders desired retirement while other key shareholders were essential to the business and desired senior management positions going forward. The company had an Employee Stock Ownership Plan which added complexity to the transaction. The company desired strong value for significant capital expenditures it had made on new capacity that was not yet on-line. Legacy’s senior bankers worked with shareholders to increase the value of the Hanson’s initial offer by over 50%. Legacy also negotiated favorable employment agreements, retention bonuses, and worked with company’s counsel, ESOP advisors, and ESOP counsel in order to coordinate all facets of the transaction. Legacy coordinated the various due diligence processes in order to minimize business disruption and increase the probability of a successful close.